APPSC Sericulture Officers Recruitment 2019, Apply Online till March 27. Sericulture Officer in A.P Sericulture Service: Andhra Pradesh Public Service Commission or APPSC has released a notification for the recruitment of Sericulture Officer in A.P Sericulture Service. 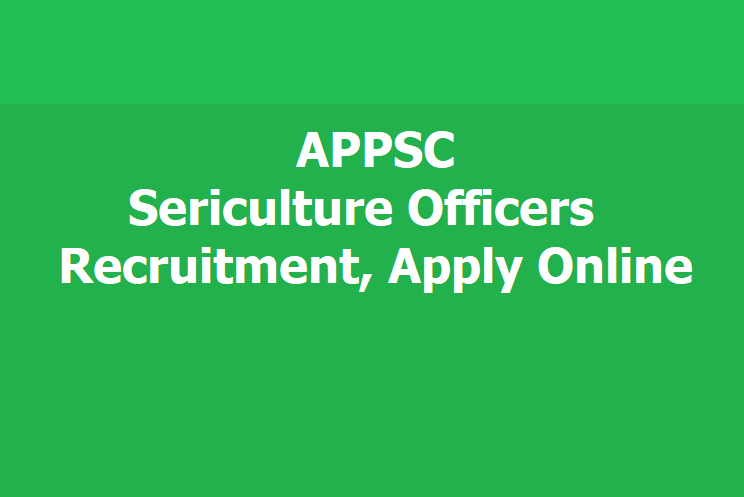 The APPSC has invited applications through online from eligible candidates for recruitment to the post of Sericulture Officer within the age group of 18 to 30 years as on July 1, 2019. The online applications for APPSC Sericulture Officer will be available on Commission's Website -- psc.ap.gov.in -- from March 06, 2019 to March 27, 2019. Out of total 13 vacancies announced Sericulture Officer in A.P Sericulture Service. Must possess Second Class Masters Degree in Science with sericulture or Botany or Zoology as subjects of study or a Bachelors Degree in Agriculture from any university established or incorporated by or under a Central Act or Provincial Act or a State Act or an Institution registered by University Grants Commission. Applicants need to apply for the post using the OTPR user ID through Commission's website. The Commission conducts Screening test in offline mode in case applicants exceed 25,000 in number and likely to be held on May 21 and 22, 2019. Instructions regarding recruitment exams can be found on the official website of APPSC.